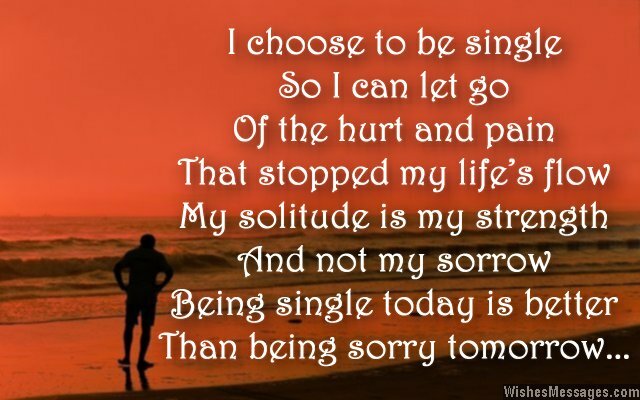 Being single poems: Is your Facebook status single? Then you will love these inspirational poems about being out of love and away from heartbreak. These cute poems are for all the single girls, boys, men, women, moms and dads who are free from a toxic relationship. Share these short rhymes as motivational quotes, pins on Pinterest and funny text messages with all your single friends. Being single is not the same as being depressed, feeling lonely and being alone. It is a beautiful phase of life which allows you to enjoy freedom, happiness and many other pleasures which people in a relationship will never experience. Whether you have just broken up with your boyfriend, girlfriend, husband or wife – always be single and happy, never single and sad.